We have 51 full time positions open for permanent hiring and these are advertised in our website nationalmuseum.gov.ph, the Civil Service website and in JobStreet Philippines. The deadline for submission of applications is on or before September 29. Most positions require civil service eligibility, an inclination for museum work and other proofs of qualifications. Please refer to the advertised posts. Job vacancies are for the Archaeology Division, Architectural Arts and Built Heritage Division, Botany and National Herbarium Division, Cultural Properties Regulation Division, Ethnology Division, Fine Arts Division, Geology and Paleontology Division, Human Resource Management Division, Museum Services Division, and Zoology Division. 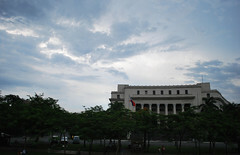 The approval from the government through the Department of Budget and Management for the reorganization of the National Museum took place last year and included 235 new positions – an unprecedented development in the history of the National Museum and the Civil Service of the Philippines. This has meant upgrading the capabilities of the NM with higher entry levels, better qualifications and more management. This progress has meant improved systems in the protection and promotion of our national patrimony. For more information, please email nationalmuseumrecruitment@gmail.com. For brief queries you may phone (02) 527 6621 Monday-Friday, 8 am-12 noon and 1-5 pm. An article highlighting the woes of maintaining Philippines’ cultural collections in the midst of competing economic pressures, poor infrastructure and looting.